"Ukrainian and other internees at the Castle Mountain Alberta internment camp in 1915"
There were 24 internment camps across Canada, including ones in Vernon, Banff, Jasper, Brandon and Kapuskasing, Ont. Some camps housed only men, while others, like the large Spirit Lake camp, held women and children, too. The camps provided a cheap way of clearing land, benefiting government and private industry at the expense of second-class immigrants, and reduced unemployment in cities.Workers were meant to be paid 20 to 30 cents a day, but many didn't get their money. "Nine holes of the Banff Springs golf course was hacked out of the bush with this slave labour," Hladyshevsky said. It's been a long time coming, the UCCLA has been lobbying for two decades to get this wrong addressed. Chretien could have done it back in 1997 or 98, 99, etc etc. "The Liberal Party understands your concern ... we support your efforts to secure the redress of Ukrainian-Canadians' claims arising from their internment and loss of freedoms during the First World War ... we will continue to monitor the situation closely and seek to ensure that the government honours its promise." Jean Chretien, Leader of the Liberal Opposition, June 8 1993. Before they interned the Japanese, the Canadian Government interned first and second wave Ukrainian immigrant. They did this creating the War Measures Act supposedly because Ukrainian immigrants were from Austro-Hungarian Empire and thus 'enemy aliens'. The real story is that they were interned for being communists, socialists, and labour radicals. 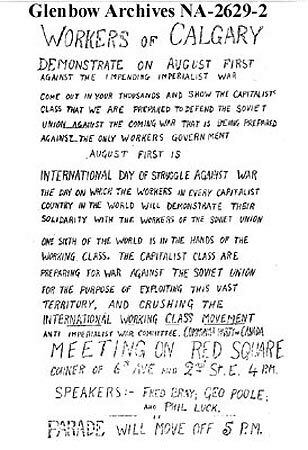 The internment and arrests coincided with the Canadian Government banning the Industrial Workers of the World, IWW, as an illegal alien organization set to overthrow the government. The War Measures Act was used against the Wobblies and other labour activists. While in the United States, they passed the Criminal Syndicalist Act to ban the IWW, who were in outspoken opposition to Imperialist War. Anti Immigrant rhetoric was used to cover up the fact that immigrant workers in Western Canada were organizing for their rights, whether those workers were Ukrainian, Italian, German, Slovian, Jews, Icelanders,English, Scots or Irish, etc. Racism against non-English speaking immigrants was virulent, all dark skinned Eastern and Central European workers (being peasants or farmworkers) were called 'niggers', by their English bosses. Ukrainians and other Eastern Europeans were called 'Bohunks'. In Alberta many of the Ukrainians along with other new immigrants, Italians, Finns, Hungarians, Germans, etc. worked in the the dark primitive coalmines in order to get wages to clear the homesteads they farmed. Homesteads that they had been promised by the CPR and Canadian government in order to open up the West. They had also been promised NO TAXES and NO CONSCRIPTION, both of which were reneged on by the Borden Conservative Government in 1917. This was why Peter Kropotkin advised the Russian Anabaptist Community, the Duhkobours to come to Canada, as pacifists they were being persecuted by the Tsar for refusal to fight in the Cimean War and WWI. The Duhkobours moved to Saskatchewan and B.C. Between 1906-1919 Alberta along with B.C. was a hotbed of labour organizing in the mining and forestry industries. And it was the 'foriegn workers' who organized usually under the leadership of English trade unionists. New immigrants helped fuel a growing militancy in the labour movement. These men and women had come to Canada seeking a better life, but many found their success hampered by anti-immigrant sentiment and unscrupulous employers. Under these circumstances, they found it necessary to either organize their own unions or join other groups that promised to promote their interests. The dissatisfaction with the quality of life in Canada experienced by some Ukrainians forced them to express their frustration in a variety of ways. "The only salvation from despair was drama and singing groups, and socialist and union organizing." Excerpt from: No Streets of Gold: A Social History of Ukrainians in Alberta, Helen Potrebenko (Vancouver: New Star Books, 1977). "Their expectations were low, revolving around work and survival. Indeed, they were preoccupied with survival.... They were willing to work long hours and endure much discomfort if it allowed them security and a viable future for their offspring. They settled for the concept of 'limited good,' but if their modest stipulations were not met, they reacted in a variety of mutinous ways." In addition, many coal miners saw their conditions as the direct result of capitalism and the systemic exploitation of the working classes. This group of militants envisioned “One Big Union” (OBU) to protect their interests. Thus, labour organization would shift from one based on a “craft” or trade to one based on all workers in all industries coming together. At the forefront were the coal miners of District 18 of the UMWA, which comprised western Canada. They wanted to withdraw from the UMWA and set up their own district—District 1, Mining Department, OBU. The UMWA tried to crush this splinter movement and in the period 1919-20 there were a number of strikes and lockouts. It was an idealistic attempt to get workers to see their commonalities rather than differences but was doomed to failure by entrenched craft and trade thinking dating back to the Middle Ages. This was the first interment, after the Winnipeg General Strike of 1919, anti- immigrant anti-bolshevik editorials advised the government of the day to deport the foriegn born Bolsheviks, 'enemy aliens'. Again Ukrainians were deported. Shortly after the strike began, Winnipeg's most influential manufacturers, bankers and politicians created the Citizens' Committee of 1000 to oppose the action. Winnipeg's leading newspapers published allegations that the strike was initiated by a small group of "alien scum"—European workers and Bolsheviks. Thus, management waged a public relations war by stereotyping the working class as dangerous foreigners—a ploy that proved successful. In the 1920's the Communist Party of Canada was declared illegal, and again Ukrainians, Finns, etc. were deported as foriegn agents of Bolshevism. The Internment and deportation of Ukrainians was poltical, tinged with the usual anti-immigrant rhetoric. The reality was it was an aspect of the class war in Western Canada that threatened the ruling class and its government in Ottawa. The practice of Internment was introduced during the Boer War, which Canadian Military Historians see as Canada's first real involvement in a Foriegn War, usually with great fanfare and cheers of our coming of age. The British developed the internment camps for the Boers in South Africa but Canada perfected it. The Boer War was a first in many ways for Canada. It was the first time we sent troops abroad. It was the first time French and English Canada fought over sending troops overseas, and it was a time when the Canadian military discovered Canadians are not born soldiers, but must be trained like everyone else. "For the first time Canadians realized that war is destructive, chaotic and messy. In wars people do get killed," says Granatstein. Internment was used as an economic measure as much as it was a political one, without the 'slave labour' of the Ukrainian internees there would be NO NATIONAL PARKS IN THE ROCKIES. Banff and Jasper as national tourist resorts were built by the slave labour of the Ukrainian internees. Life in the internment camps was often harsh, and the lives of the prisoners were often consid­ered expendable to many of their guards. In Canmore and Banff the in­terred prisoners were used to help build roads, create the golf course in Banff , and work the mines in Canmore. Two camps were set up between 1915 and 1917 in what is now Banff National Park . The Cave and Basin camp area near the Banff townsite was used in the winter, and the other at Cas­tle Mountain , was used during the summer months. Growing up in Alberta with the Rockies as a favourite holiday destination, I only learned about the WWI internment of Ukrainian Canadians in the national parks on a trip to Jasper in Spring 2000. There, I came across Bill Waiser's book, Park Prisoners. Shortly afterwards, I read In the Shadow of the Rockies: Diary of the Castle Mountain Internment Camp, 1915-1917 by Bodhan Kordan & Peter Melnycky. When war broke out in 1914, Galicia was part of the Austro-Hungarian Empire, and Ukrainian immigrants (often referred to as "Galicians" in the early 1900s) became "enemy aliens" in Canada, the very place that had actively encouraged their immigration. Ironically, most of them viewed their former Austro-Hungarian rulers not with loyalty, but as occupiers and exploiters of their Ukrainian homeland. Wherever nightfall finds me, there I bed down. Hej-ja-hej, there I bed down. Over there my young wife is crying for me. I came to Canada in search of happiness. Hej-ja-hej, in search of happiness. Somewhere my beloved is writing a letter to me. Hej-ja-hej, is writing a letter. When I read it, I washed myself in tears. Hej-ja-hej, washed myself in tears. I never received the letter from my family. Kordan, B.S. & Melnycky, P. (1991). In the Shadow of the Rockies: Diary of the Castle Mountain Internment Camp, 1915-1917. Canadian Institute of the Canadian Studies Press: University of Alberta, Edmonton. Waiser, B. (1995). Park prisoners: The Untold Story of Western Canada's National Parks, 1915-1946. Fifth House: Calgary. Doskoch, W.H. (2001). Oral history interview by Alberta Labour History Institute. Unpublished. Doskoch, W.H. (1993). Strait from the Heart: Biography of W (Bill) Doskoch, 1893 - 1941. Self-published. At the same time as the internment was happening to the Ukrainians the Canadian Government and its mercantilist ruling class which owned the CPR were using Chinese labourers to finish building the railway. They imposed a head tax on Chinese workers, to stop them from immigrating to Canada. They were ok for forced labour at cheap wages, another reason the IWW attempted to organize these workers on the railway, but they were not good enough to become Canadians. And like the Ukrainian Internee campaign, the Chinese Redress campaign has been going on for over two decades. The Chinese Immigration Act of 1885, 1900, and 1903 were a series of anti-Chinese legislations in Canada that were meant to discourage Chinese from entering Canada after the completion of the Canadian Pacific Railway. These legislations are examples of institutional racism against the Chinese in Canada.The Government of Canada collected well over $23 million from about 82000 head tax payers, some of the money were used to support Canada's war effort in World War I. In 1909, Dere's grandfather arrived in Canada only to hand over $500 to the government for simply being Chinese. Now, a special United Nations rapporteur is urging the Canadian government to pay back the money owed to Dere and thousands of other Chinese immigrants and their families who were forced to pay the so-called Chinese head tax. It was July 15, 1921 when the "Controller of Chinese Immigration" clerk scrawled his signature on the head-tax receipt for Mah Ming Sun, who would take the Canadian name Wally. He and his uncle had just disembarked a steamer from Canton, China. Wally's father had scraped together enough as a labourer building the railroad near Revelstoke, B.C., to pay their passage and the tax. The white children taunted him at school in Kelowna, B.C. "Chink-Chong Chinaman," they would jeer. The labour movement in Canada never forgot the internment and exploitation of Canada's immigrant working class. When the depression hit in the 1930's the Government of the day, again the Conservatives this time under Prime Minister R. B. Bennet from Alberta, used internment camps to deal with mass unemployment. They called them 'Relief camps' and rather than providing unemployment benefits all able bodied single men were shipped out of Western Canada's cities, to once again work in forced labour camps under the watchful eye of the Canadian Army and RCMP. Mass unemployment affected every advanced industrial country in the world, and in response the most radical activists in the labour and farmers movement, usually the communists and anarchists, organized mass Hunger Marches of the unemployed demanding unemployment payments, veterans payments, and farm subsidies. In Western Canada Hunger Marches were held and were brutally repressed by police assaults ordered by the provincial governments of the day. Including the famous battle of the Evergreens in Edmonton in the winter of 1932. The outrage of the citizens at being attacked by their own government, the United Farmers of Alberta, with the support of the Mayor and city council who were all trade unionists and members of the Edmonton Trades and Labour Council, led to the defeat of the electoral left in Alberta and the rise to power of the Social Credit party. In December 1932 unemployed men from all around the prairies congregated in Edmonton. The purpose? - to participate in a ""Hunger March"" to the Alberta Legislature to raise awareness of their desperate situation. A clash between marchers and police resulted in the arrest of 29 participants. The Edmonton Hunger March took place on Tuesday, December 20, 1932. Protesters planned to walk in an orderly and peaceful manner from Market Square (currently the Stanley Milner Public Library) to the Legislature to ask for government assistance for farmers and the unemployed in the midst of the Depression. Wielding billy clubs, police on horseback broke up the march. In researching this event, I read an unpublished letter to the Edmonton Journal, written by William Dolinsky in 1999, in which he described the events he had witnessed. He wrote: "I remember well this Bloody Tuesday" and asserted, so eloquently and simply: "We were good people". Of the 10,000 people reportedly in the square that day, I imagined the debacle from the point of view of a mother with two children. Where was the government who wouldn't let us starve? Now I've read it in the paper, this supposed "Hunger March"
Again the leadership in Alberta of the mass movement was Ukrainans in the Worker Farmer Unity League. Several were arrested and tried for inciting a riot and seditious insurrection. By 1935 a mass movement of labour activism across the west, mobilized the On to Ottawa trek, it emptied the relief camps of thousands of workers, who then hopped on trains, the CPR again, and were brutally attacked by the CPR police, as well as by the RCMP as they attempted to 'march on Ottawa' to demand an end to internment and demand Unemployment Insurance. They were stopped in Regina where they were met with brutal repression by the RCMP. Alberta experienced its greatest period of social and economic crisis during the 1930s, better known as the "Dirty Thirties." Trigger by Europe's cut in Canadian food imports the Depression saw wheat prices plunge and that combined with a drought that destroyed many family farms. Railways and mines cut back on their operations and shop laid off employees. Both rural and urban communities were in crisis sending many families to seek relief aid from the government to keep from starving. Many unemployed men began wandering the country, riding the train boxcars, looking for any kind of work. A number of these men ended up working in government relief camps that were no better than hard labour internment camps. The men resented these harsh conditions and organized the Communist-led Relief Camp Workers Union of the Worker’s Unity League organised the On-to-Ottawa-Trek in 1935. Unemployed single men left the relief camps of British Columbia in June on board east-bound trains. The marchers halted at Regina when its leader, Arthur Evans (a former OBU organizer), and others went to Ottawa to express their grievances to Prime Minister R. B. Bennett. Having little sympathy for the protesters, Bennett ordered the Royal Canadian Mounted Police to ambush the protesters and force them to return to the relief camps. Bennett’s order resulted in the Regina Riot of 1 July 1935. Disappointed, 1250 of the protesters volunteered for the Mackenzie-Papineau Battalion to fight for the Spanish Republic during the Spanish Civil War. At least 25 of these men were from Alberta. Many of the Spanish Civil War veterans returned to offer their battle experience to the Canadian Armed Forces and fought as heroes during World War II. Internment was again used in World War II. It was used as a racist reaction against Japanese Canadian. The first internment had been against Ukrainians because of our language and cultural differences which in itself was racism by the English ruling class. In the case of the Japanese it was because they were a visble minority. Once the bombing on Pearl Harbour happened racism came to a head. British Columbians started to blame all their troubles and problems on the Japanese. Japanese people were blamed for everything from a bad crop to a flat tire. The scared people of BC cried out, wanting the BC Government to deal with the problem as they saw it-Japanese Canadians. The people of British Columbia wanted to feel safe in their homes again and they wanted Prime Minister Mackenzie King to rid Canada of people of Japanese orign. They were causing a threat to Canada (or so it was believed by the public.) Mackenzie King wanted the votes from B.C. so he was more than happy to do what they asked. Mackenzie's first order of business was to incarcerate all Japanese males between the ages 14 and 45. They were ordered to move more than 160 km inland. This was to "safe guard" the pacific coast from Japanese spies. The Canadian government took away all of the Japanese fishing fleets, in order to protect Canada. The war caused a large labour shortage for farmers, especially sugar beet farmers. The Security Commission Council organized sugar beet projects to combat the labour shortage. This gave the Japanese males a choice. The choice was to work in road camps as slaves or go to the beet camps and be with their families. Working in the beet camps was the choice taken by the majority of Japanese married men. Lethbridge and Southen Alberta boomed with sugar beet production as Japanese families were moved into the province during the war. Once again internment was as much about economics as it was about race and politics. Southern Alberta farmers benefited from the forced labour, and many being former American emigres Mormons in particular, their white racist communities were the perfect location for a visible minority. Unlike the United States, where families were generally kept together, Canada initially sent its male evacuees to road camps in the B.C. interior, to sugar beet projects on the Prairies, or to internment in a POW camp in Ontario, while women and children were moved to six inland B.C. towns created or revived to house the relocated populace. There the living conditions were so poor that the citizens of wartime Japan even sent supplemental food shipments through the Red Cross. During the period of detention, the Canadian government spent one-third the per capita amount expended by the U.S. on Japanese American evacuees. Not until 1949, four years after Japan had surrendered, were the majority of Nikkei allowed to return to British Columbia. By then most had chosen to begin life anew elsewhere in Canada. Their property had long before been confiscated and sold at a fraction of its worth. Today Lethbridge, Warner, Taber, Raymond, Alberta which are the sugar beet centres of Canada, are also home to a large Japanese Canadian community, which grew up there in concentration camps and then made it their home. Again the use of the 'Concentration Camp', developed by the British but perfected by the Canadian State, was not for keeping prisoners, it was for the extraction of 'Forced Labour', the exploitation of workers. Let us never forget that. And it was used against visible minorities, it was the original source of 'racial profiling'. Ukrainian-Canadians have long sought redress for the internment of 8,579 Eastern Europeans during the First World War, a 'dark chapter' that Prime Minister Paul Martin acknowledged this week. It is one of 13 claims put forward by ethnic and religious groups. In Canada's residential schools, aboriginal children were forced to assimilate and many were abused. Discrimination against immigrants from China, including a $500 head tax. Imprisonment of leprosy patients, mostly Chinese, on two Victoria-area islands. The unjust treatment of black immigrants from the Caribbean. The internment of Ukrainian-Canadians during the First World War. The ban of Jewish immigrants in the mid-20th century, including the time a boat carrying more than 900 German Jews was turned away from a Canadian port in 1939. The internment of Italian-Canadians during the Second World War. The internment of German-Canadians during the Second World War. The internment and relocation of Japanese-Canadians during and after the Second World War. The discrimination against aboriginal war veterans, who were offered $20,000 each in compensation in 2002.
z African-Canadians nationally, including the descendants of black Loyalists, are mobilizing toward a collective claim for reparations. z In Nova Scotia, the Africville Community is working toward advancing its claims for reparations. z The Doukhobors, for the forced confinement of children in a sanitorium by the B.C. government. Today with the so called phoney war on Terrorism, the new security State in Canada is once again threatening the civil liberties of it's citizens and racial profiling those immigrants coming from Muslim countries. Will we see a call for internment of these folks like we have in the past. Not if we are vigilant and learn the lessons of the past. It is up to the labour movement, progressives, Canadians who are concerned about civil liberties and human rights, and most importantly by those communities such as the Ukrainians, Chinese, Japanese, Indigenous peoples, etc. who have been brutalized by the Canadian state to speak out and say loudly and clearly: NEVER AGAIN! OTTAWA - The Supreme Court will decide whether Canada's security certificate policy, which permits non-citizens to be kicked out of the country based on secret evidence that they endanger national security, should be struck down for violating the Charter of Rights and Canada's international commitments.he high court announced yesterday it will hear the appeal of Moroccan-born permanent resident Adil Charkaoui of Montreal, who is accused by immigration authorities of being an al-Qaeda sleeper agent, a charge he denies. Before being granted bail under strict conditions last February, the father of two was detained for 21 months on a security certificate under Canada's immigration laws. Mr. Charkaoui argues the security certificate system is a Kafkaesque violation of his Charter right to a fair hearing and to defend himself because it allows immigration authorities to deport foreign nationals and permanent residents without fully disclosing to them the evidence that allegedly shows that they are a danger to Canadians. Canada's spy agency had concerns about Maher Arar returning to Canada from Syria, but never believed he should remain in a Syrian jail, the second-highest ranking official at CSIS testified yesterday. Jack Hooper, deputy director of the agency, told the Arar inquiry that the Canadian Security Intelligence Service detailed those concerns to the solicitor-general, Foreign Affairs officials and others inside government. Among them: CSIS's ability to deport non-citizens using security certificates could be diminished. My Grandfather on my mothers side of our family was a miner in Wayne Alberta, and a homesteader. My grandfather on my fathers side was a scholar, the first presbrysterian preacher in the Ukrainian community, a labour activist and helped found the Ukrainian Farmer Labour Temple Association the precursor to the Association of United Ukrainian Canadians. My partners grandparents and family on her mothers side were Japanese Canadians who were interened during WWII in Warner Alberta. Her grandfather was a Bhuddist priest. This article is in memory of Comrade George Piche, who passed away July 2005, a tireless fighter for worker and immigrant rights in Canada. And I would like to thank Maria Dunn for her efforts to document in song the workers history of Alberta.